Our Leadership Development course – "From Unconscious Bias to Inclusive Behaviors”, creates awareness of unconscious bias and moves beyond it to implementing the “Three Rs” of Inclusive Behaviors for Organizational leaders to implement in their daily lives. Unconscious Bias Awareness training is important, but on its own does not lead to behavior change. This unique leadership training incorporates interactivity and exercises that lead to the transformational culture change required to improve employee engagement, business performance, and innovation. Our micro-learning modules are 17% more effective than traditional training, providing quickly accessible content that easily adapts to busy schedules. The result is diversity and inclusion training that matters to the bottom line through through leadership development that leads to sustained and increased employee engagement, productivity, innovation, and ultimately, better business results. Through this program, individuals, teams, managers, and leaders develop an understanding of how inclusion drives performance. Their unconscious bias awareness is lifted to a new level. 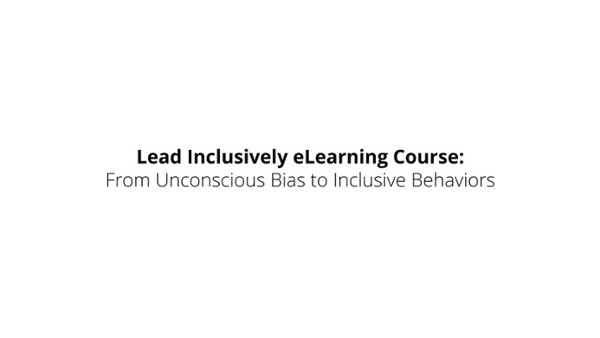 Once these leaders become “aware,” they can use the “Three Rs” of Inclusive Behaviors to make their learning actionable in their interactions with their teams, which accomplishes something that “Unconscious Bias Awareness Training” cannot . Also while you're here, try our Organizational Mini-Assessment and Goalsetting worksheet to build a platform from which to identify areas for improvement, and a springboard to create strategic goals to effectively address them. Always feel free to reach out directly at info@leadinclusively.com to speak with an expert regarding the courses and their delivery capabilities. We look forward to connecting with you.